Brian Boussy has been working with goalkeepers for over 15 years. After a successful playing career that included a US Soccer Youth National Championship and a 4 year career at Boston College, Brian began coaching teams and training goalkeepers. A high school History teacher in Howard County, Brian is able to combine soccer knowledge with a strong education background and knowledge of how kids learn. The result is an environment where keepers are taught, not simple worked-out. Brian is currently the goalkeeper trainer for the McDaniel College Women's team. In 2016 Brian coached McDaniel's first All-American goalkeeper, Sarah McDonald. 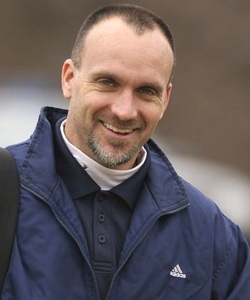 In addition to McDaniel College, Brian is currently the Director of Coaching for the Freedom Soccer Club. All-met, All-state, Baltimore Sun and Washington Post Player of the Year. 4 year Varsity goalkeeper Boston College.